Investors like us love ASCO because of the so-called "ASCO Effect" - a hefty surge in cancer-focused biotech stocks that always accompanies the start of this meeting. A number of promising cancer treatments were presented this week by key global pharmaceutical players at the 2014 Annual Meeting of the American Society of Clinical Oncology (ASCO) - which is why this is a key time of year to watch a specific group of biotech stocks. The event, which this year took place May 30 - June 3, is attended by thousands of renowned oncologists, researchers, analysts, and investors. It is unquestionably the most highly anticipated and most news-generating cancer research meeting of the year. ASCO can deliver a blockbuster, breakout drug that will not only lead to better cancer treatments, but one that will also bring in billions of dollars in revenue. Moreover, there's also the potential of a drug's developer becoming a profitable takeover target. 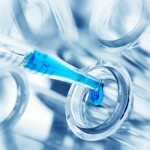 Check out this list of biotech stocks to watch post-ASCO.